Chocolate Fudge Pie is delicious, rich and decadent homemade chocolate pie, made from scratch! Perfect solution when you need quick and easy dessert! No, don’t get me wrong! I realy love my son Marco’s birthday party, but some of the things can simply make me go crazy! Come to think of it, those are not birthday, but more “postbirthday” concerns. And here is what it’s about! Since we want as many guests as possible at the party every year, we simply rent our favorite restaurant. Of course, counting on most of the guests coming, besides the birthday cake, I always make a ton of cakes, salty nibbles and little things like that. And always, some of the guests are not able to come. Doesn’t matter! But then, for days, we have to eat all the food that is left from the party! An even bigger problem is that the guests that could not make it to the party, still want to see Marco and give him a present, so they come days and days after his actul birthday. And so, the party sometimes lasts 10 days “after”. And this year, the usual few days became two weeks. Last on the guest list was my dear cousin Dobby, who said he was coming 15 days after the party to pay a “birthday visit”. Well, OK, when we were able to survive everything until now, we will also survive this also. But this time, there was nothing from the party left in my kitchen. And my cousin Dobby who has „sweet tooth“, just like me, always looked forward to the visits because he knew something sweet was waiting on the table. So, what delicious treat to prepare and not spend the whole day in the kitchen? I know that my cousin is a great chocoholic, just like me, but baking a cake was too complicated at that moment. And then I got the answer in two words!!! 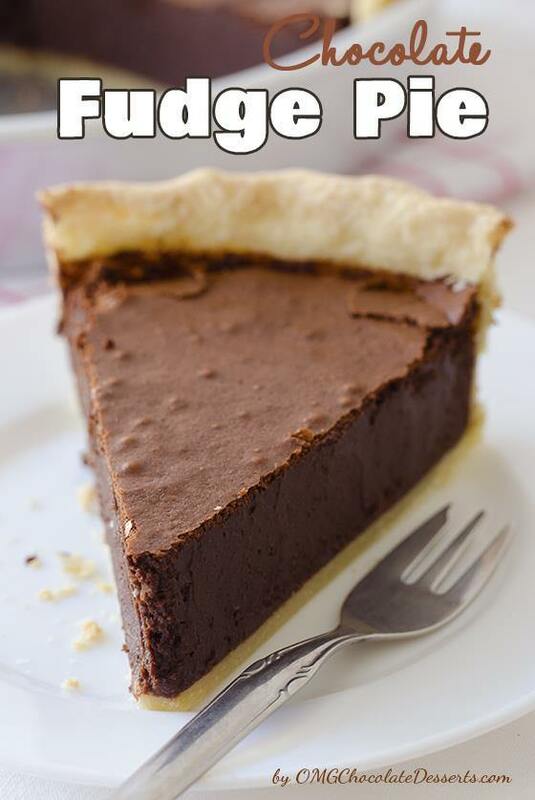 Chocolate pie! Decadent enough and not that complicated. That is it! And the best witness of the things I’m telling you about is my good cousin Dobby, who was so delighted after a few tasty slices of Chocolate Fudge Pie that he took a few slices with him “for the road” 🙂 . 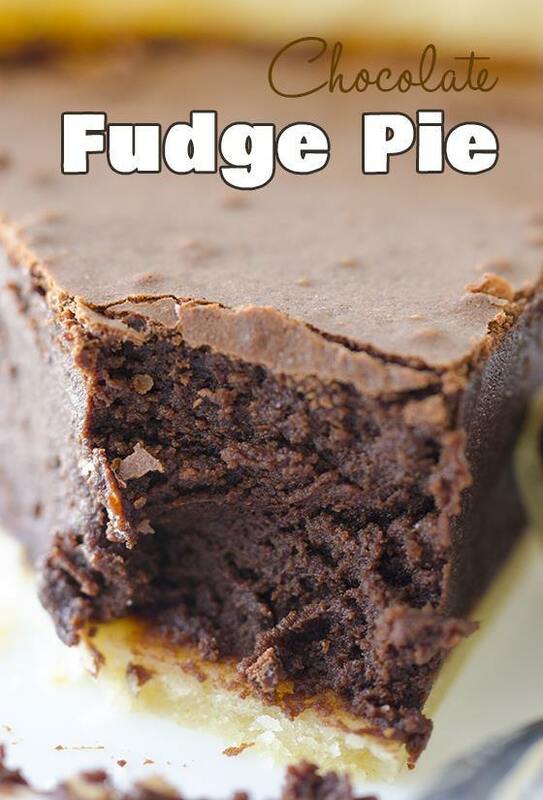 Homemade fudge pie with rich and dense, moist chocolate filling. In a large bowl whisk together flour, sugar and salt. Add butter and mix with a fork until it starts to look like a coarse meal. Add 1 tablespoon of water at the time and continue mixing until a dough forms. Wrap the dough with the plastic wrap and refrigerate for 2 hours. Lightly greased 9-inch pie plate and preheat oven to 350 F.
Take the dough from refrigerator and roll out on a lightly floured work surface into a circle about 1/8 inch thick. Transfer the dough to a pie plate and trim excess of a dough from edges. In a bowl whisk together sugar, cocoa powder, flour, and salt. Transfer filling to pie crust in pan. What is half and half ? Hi Anita, half and half is diary product of equal parts light cream and milk, and has 10-12% milk fat. You can substitute 4-1/2 teaspoons melted butter plus enough whole milk to equal 1 cup. Is half and half the same as buttermilk? No, but you can substitute 1 cup half and half with 4-1/2 teaspoons melted butter plus enough whole milk to equal 1 cup. I didn’t see what temperature to put the oven on? I want to make this now but it’s raining and I don’t want to go to the store. I have 2%, sweetened condensed and evaporated and dry milk but no whole milk………. Hi Yora,bake the crust and the filling together, you don’t have to bake the crust before you add the filling. Looks so delicious; do leftovers need to be refrigerated? Thanks! Hi Virginia, keep the leftovers it in the fridge. Made this pie for a friends birthday, big hit, everyone wants the recipe, think I’ll keep it to myself though,. Thanks for making me the chocolate pie queen at work. Hello I made this last night and it came out beautiful! it is the perfect texture and didn’t under/over cook at all. my only concern is that its very bitter. I just checked my cocoa and it says unsweetened. I see it doesn’t specify on this recipe. did you use sweetened cocoa?? I may try it with a sweeter chocolate. I love how easy the crust was! Any update here. I’d like to make tomorrow. Do you think semi sweet morsels would make a difference? Hi Christie, I think it will work, too. What is ‘half and half’? Hi Liz, it’s dairy product-mixture of one part milk and one part cream. You can find many homemade substitute recipe all over the web. I made this, substituted evaporated milk and semi sweet morsels, cut down on the sugar. Wasn’t very good. You used the wrong milk, chocolate, and sugar and call it a bad recipe? That’s user error, not the recipe. Please keep that in mind when reviewing a recipe. I made it today and thought it was delicious! It’s more of a darkish chocolate but so good. I would serve it up with some freshly whipped cream. I don’t get substituting everything in the pie and then saying it wasn’t very good either. Either get the right ingredients or simply make a different pie. Hi Adry, I think you could use it for pumpkin pie, too. I don’t have half and half, but have heavy whipping cream and whole milk. What do you think would work better – butter and whole milk substitute or heavy whipping cream? Also, I’m making this for my husband’s bday. Should I wait and bake it just before we eat it, or is it ok to bake ahead of time and warm before serving? He loves dark chocolate. Can’t wait to serve this tonight. Thank you! Hi Beverly, you can use butter and whole milk substitute.You can bake it ahead of time,I like it even more when it’s cooled completely,but it is a matter of taste. Thank you for your quick reply! Off to borrow some eggs now! 🙂 Baking ahead is a huge help with 3 basketball games before we can properly celebrate! Looking forward to making this a staple! My family doesn’t care for bittersweet chocolate. will Milk or a lower % of Cocoa (in the form of a chocolate bar) work? like Milk chocolate for instance?? Hi Valerie,you could use milk chocolate baking bar. How long does this keep? I need to bake Monday for Thursday eve… Will it work? Hi Gina Ann, when it’s cooled completely cover it well(not to dry out) and place back in the fridge. Yes, but how far in advance can I make it? You can keep it for a few days. Hi, I’m in love with the comments on this recipe so I’m going to bake it tonight for tomorrow. Just a couple questions first. if I use salted butter, should I leave out the 1/4 tspn of salt? also, I don’t want to ruin this pie so what do I do about the possible bitterness? should I use semi sweet chocolate? WOW! This is rich, smooth and utterly decadent, similar to the inside of a silky chocolate truffle, not the consistency of a brownie. I made this for Christmas and it got excellent reviews. I made a very small change to the recipe; I used 4 eggs and increased the sugar and butter slightly (maybe a tablespoon each). It was not difficult to make at all. YUM! Made this today for my husbands birthday. He loves dark chocolate and rich desserts. Followed the recipe exactly and it turned out amazing. Pairs great with vanilla ice cream. So i use 2 whole eggs and 3 yolks??? So I’m gonna need 5 eggs to make this right??? Hi Crissy, yes you’ll need 5 eggs. Will it be bad if I use the entire egg instead of just the yolk in the 2 yolks? thanks! Can I use a graham cracker crust for this pie? Hi Kay, I think you could do that. for all the people who asked what is 1/2 & 1/2. It the little plastic tubs on the tables at restaurants to use in your coffee. I want to make this tonight I was wondering if I can do half bittersweet and Half semi sweet to avoid the bitter taste? Thank you. This pie is excellent. I laughed when I saw in the comments that someone asked you, “What is half and half?” My son and I were on the internet looking for a chocolate pie recipe I could whip up for him out of the ingredients I had on hand… kept bypassing all the ones that called for cream… always have h-n-h in the fridge for our coffee! We LOVE bittersweet chocolate so I actually REDUCED the sugar to 1 cup. I used Ghiradelli Bittersweet Baking Chips (maybe it’s sweeter than some?) I am too lazy to make a pie crust from scratch, baked with a roll-out dough Pillsbury crust. Took it to a ladies’ dinner club gathering last night to rave reviews; gave your website full credit (tho I told them about my sweetener tweak). Half and Half is in the refrigerated section between the milk and the coffee creamers. If you have heavy cream and whole milk mix a half a cup of each. OMG! Such a good recipe. Made this last night for some friends that came over for dinner and it was a hit. Didn’t have half and half, but I did have heavy cream- did 2/3cup milk and 1/3cup heavy cream and it worked just fine. Had a bite of the leftovers after work and it’s even delicious cold. This is a keeper! I’ve made these a few times now and they always turn out perfect! I make them into small bite size tarts, perfect for a crowd to grab and go. I bake the small tarts at 350 for 22 minutes. Thanks for the recipe!! Does this need to be refrigerated after it is made? Hi Sandy, this should be served warm, but I like to eat it chilled from the fridge, too. Made has directed, used a deep dish pie pan, then poured a chocolate gananche over it when cooled. Gave a even more fnished look and added to the chocolate overdose. This is the best chocolate fudge pie ever—and it is easy! I have made it a dozen times and it is a hit every time. I use a premise frozen pie crust—be sure to use a deep dish pie crust. I followed recipe exactly except I used. I’ll instead of half and half. It just seemed too gooey inside. I guess a toothpick shouldn’t come out clean? That’s for cakes not pies maybe? I even cooked it over an hour and increased the temp. What did I do wrong? Or was it right? Turned out soo good! Used 4 whole eggs because I’m a rebel. Only had unsweetened chocolate so I had to do math, turns out the substitute for 1 oz bittersweet is 2/3 oz unsweetened + 2 tsp sugar. I can feel the mood-lifting therapeutic medicinal chocolate-ness coursing through my brain when I eat it.